Ulman, H. Lewis. Things, Thoughts, Words, and Actions : The Problem of Language in Late Eighteenth-Century British Rhetorical Theory. 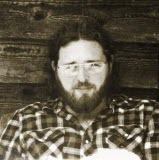 Carbondale: Southern Illinois University Press, 1994. Print. 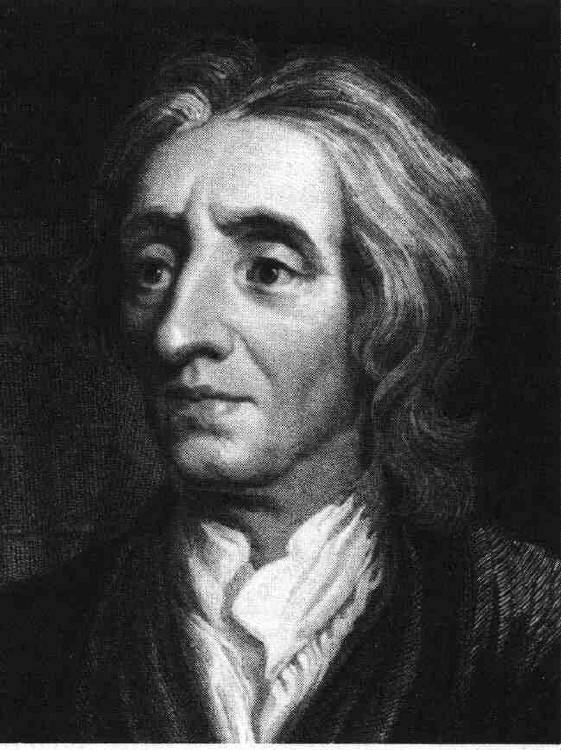 Main claim of Howell’s 18th Century British Logic and Rhetoric: “the new rhetoric of late 18th century Britain was largely responsible to the new science of Bacon, Newton, and Locke, an interpretation that emphasized the psychological and epistemological grounding of British rhetoric from 1750-1800” (1). U. claims that the now familiar binary between rhetorical realism (a common designation for the 18th century) and social constructionism (or relativism) actually first appeared during the 18th century. 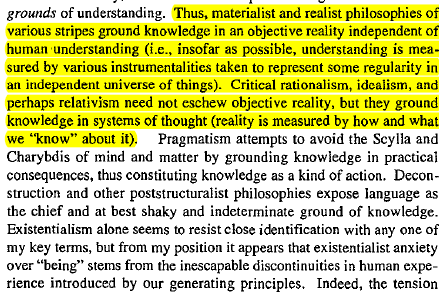 U. claims that in an attempt to build a theory that teases out the relationships among things, thoughts, words, and actions that addresses problems in communication we should pay special attention to issues of empiricism/skepticism in relation to realism/social constructionism. 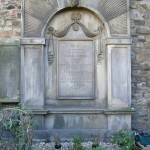 Four perspectives on 18th century rhetoric: 1) neoclassicism – Ward’s System of Oratory; 2) elocution – Sheridan’s Lectures that focus on delivery and oratory; 3) belletristic rhetoric – Blair’s Lectures emphasize the importance of taste and style in oratory and composition; and 4) epistemological rhetoric – Campbell’s Rhetoric attempts to create a philosophy of rhetoric in response to psychological and epistemological theories of the “new science” (empiricism, Common Sense realism). How do the “commonplaces” of things, thoughts, words, and actions operate in each of the case studies in the book? They describe different theories of language, assist in identifying the “continuities and discontinuities” in language problems during the 18th century, and attempt to propose rhetoric as a “pluralistic stance” on the problem of language. This last element repositions the problem of language in a way that moves beyond/outside the realist-antirealist rhetorical designations that characterize the postmodern turn in the Humanities. This chapter considers the historiographical method that Ulman uses in detail to pursue his project of theory building. U. claims that – via Locke, McKeon and Burke – 18th century theories of language are part of a longer tradition whose roots are found in the “philosophical commonplaces of thoughts, words, and actions” (3). A central problem for rhetoric throughout the ages: Language is ambiguous and imprecise . . . as such, the relationship between language filtered through human subjectivity distorts the real in ways that make language use an irrational act; contrarily, rhetoric and language use appeal to the imaginations and passion in ways that appeal to reason as there is no impartial human subject. As such, language use is imperfect but powerful and, perhaps, the only medium of shaping and sharing knowledge about our ontolog(ies) (10). 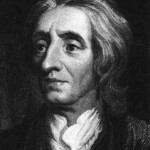 A breakdown on Locke’s philosophical commonplaces: things are not necessarily physical objects but physical objects that are objectified by being described in language. 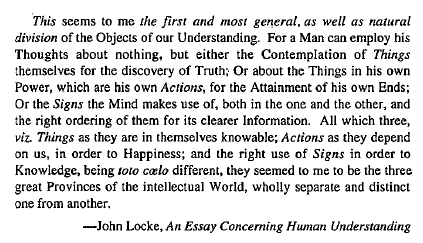 Things are objects; actions are the “skill of Right applying our own powers and actions” to things; Words (or signs in Locke’s language) are concerned with transmitting understandings of things in knowledge to others. Human thought/understanding is a “matrix of things, signs, and actions” (12). Bakhtinian Locke? “There is so close a connexion between Ideas and Words . . . that it is impossible to speak clearly and distinctly of our Knowledge, which all consists in Propositions, without considering, first, the Nature, Use, and Signification of Language” (401, U. 14). U. doesn’t want to turn philosophy into rhetoric or vice-versa; rather, he wants to locate a common ground between the two and sees Things, Thoughts, Words, and Actions as generative commonplaces that appear in both traditions. 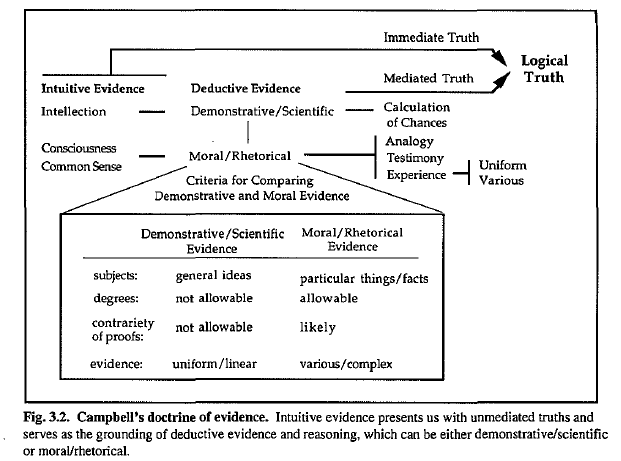 Consider: the tension between “truth” and “persuasiveness” both rely on T/T/W/A to function. 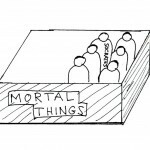 THINGS – the nature of that which a statement objectifies in relation to some system of objects. THOUGHTS – the nature of the meaning expressed by a statement in relation to a system of intersubjectivity (the intersubjectivity is constructed through use of signs/symbols). WORDS – the nature of a statement in relation to the system of signs from which it is constructed. ACTIONS – the nature of the consequences entailed by the statement in relation to a system of influence among words, thoughts, things, and actions (18). This is the theory chapter. It outlines the different theoretical problems of language in the 17th and 18th century. U. argues that most 18th century rhetoricians believed that language – in some way – reflects thought; however, he sees each of those reflections as specific to particular thinkers. How did language operate in terms of grammarians, rhetoricians and philosophers in the 18th century? 1) Grammarians – language is an orderly system of sigs; 2) Rhetoricians – language is an instrument or medium of communicative action; and 3) Philosophy – language is an obstacle/distorting mechanism to discovering the truth. Lockean conception of ideas and language: simple ideas (like a color) are incommunicable; however, complex ideas (like a factory) can be explained by the interrelationship of several simple ideas. This process of interweaving is the act of Composition – an imprint of complex ideas in the mind that never existed before so that a Name/Complex Thing can be understood (Locke, 425). 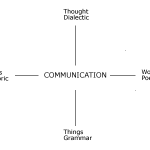 Root of linguistics split from rhetoric-philosophy: the idea that words could be studied primarily as material artifacts or things rather than as signs of thought or instruments of communicative action (59). 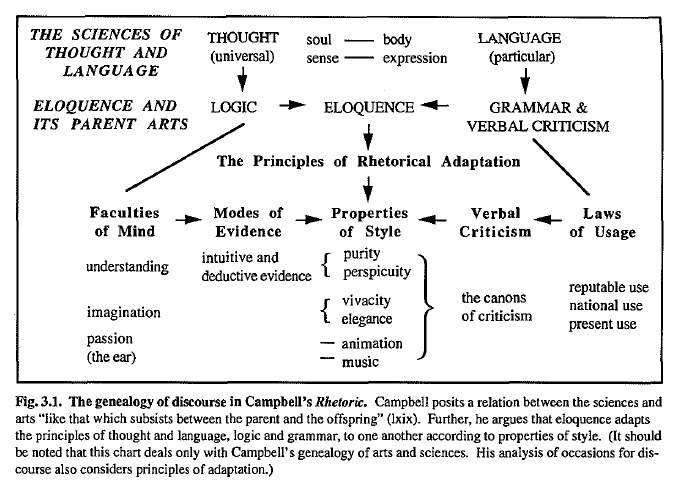 In Campbell rhetoric is a mostly theoretical art that sees the role of rhetoric as a process of connecting the hidden thoughts of the mind (imagination) to spoken/written language. 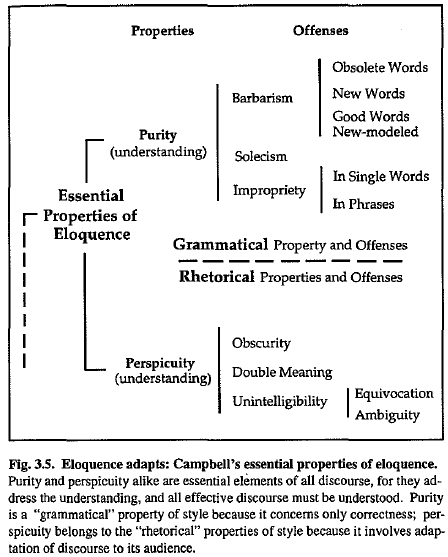 Principle axiom of Campbell’s theory of language – “Every tongue whatever is founded in use or custom” (79). What’s a grammar? “static abstraction from the living language and the normative force of standard usage is a social rather than a natural phenomenon” – this is a distinctly sociolinguistic perspective (86). 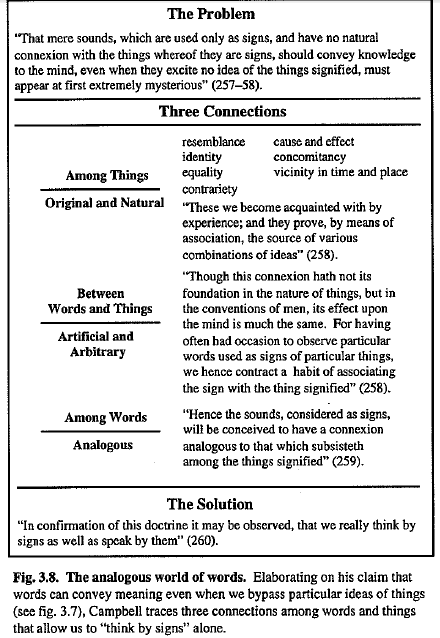 U. links Campbell to Locke in his consideration of language as a series of signs that represent ideas (though whether language is significatory or representational is never elucidated) that are derived from things. Campbell notes, “Words may be remembered as sounds, but cannot be understood as signs, whilst we remain unacquainted with the things signified” (142). U. contrasts Blair’s rhetoric with Campbell’s by drawing attention to the ways that Blair attempts to focus on words as things, “signs whose material or formal qualities incorporate the cultural and intellectual circumstances of speakers and writers.” This resituates words as things, aesthetic objects that are appreciated by cultures who have advanced knowledge and refined taste. 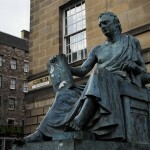 Blair’s articulation of rhetoric in the Lectures is teleological – it provides an end-point for the newly enculturating Scottish outsider: “he implicitly and explicitly links the progress of society, language, taste, and the arts to the improvement of individuals” (118). Yet, Blair never really provides, according to U., an epistemological account of language; rather, he is more interested in how language and knowledge have developed contemporaneously in a progressive narrative that ends at his age. U. claims that Blair does subscribe to the Lockean idea that words are signs of ideas and he believes that the function of language is to move others to action; however, U. then claims that Blair is most consistent in equating words and things: words are “objects of art that reflect the intellectual and social circumstance of individuals and cultures” (119). So, this representationalism firmly entrenches Blair in the Modernist camp, viewing language as representative of reality, not interpretive of reality. 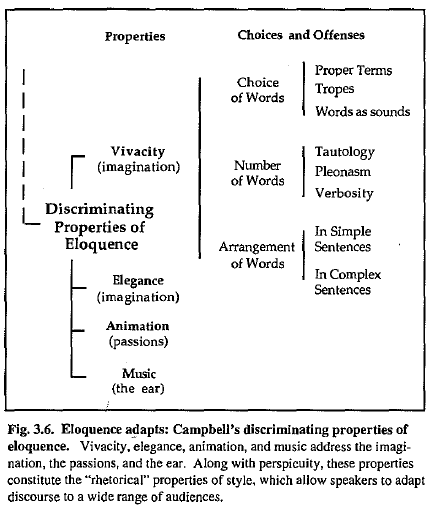 According to U., Campbell’s treatment of words as thoughts provides for ongoing adaptation and innovation while Blair’s conception of words as things pushes language toward a reified, teleological end – a myth of linguistic progress toward particularist perfection (145).